According to USCIS records, congressional testimony and interviews with former agency officials, USCIS has plunged most of the expedited program’s revenues from the last eight years — some $2.3 billion — into a failed effort to digitize the larger immigration system, leaving inadequate resources to staff the H-1B portion that was its cash cow. It’ll also cost USCIS up to $100 million in lost fees, agency spokeswoman Carolyn Gwathmey acknowledged. Gwathmey said the loss would be cushioned by a $700 million reserve fund created by a surplus of premium processing fees and “would not negatively impact” the agency’s ability to keep paying for the digitization initiative, which is $1 billion over budget and five years behind schedule. But the interruption has fueled concerns about the Trump administration’s intentions for the H-1B program overall and the fate of the digital push that expedited H-1Bs have funded. Many H-1Bs are gobbled up by outsourcing companies, and President Trump promised during his campaign to make sure visa holders weren’t displacing Americans for jobs. In January, a draft executive order aimed at cracking down on work visas leaked and, while it hasn’t been signed, Politico reported it may be soon. In recent days, the Justice Department and USCIS have announced initiatives to look into H-1B fraud and abuse and USCIS has said that some entry-level computer programmers may no longer be eligible for H-1Bs. 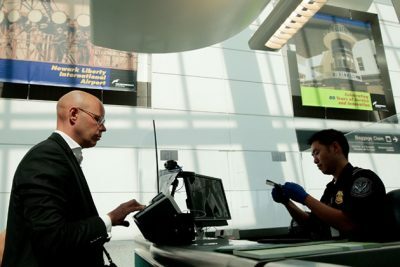 The suspension of premium processing won’t affect the number of H-1B visas issued, even to outsourcing firms, but critics worry that lost revenue from the program will extend the agency’s digitization delays and, thus, perpetuate the backlogs that led to the stoppage in the first place. “Any CEO who would propose to cut the source of all your revenue — while at the same time still paying to fix your product — would be fired,” said Greg Siskind, a longtime immigration lawyer. The snail’s pace was due in part to sheer volume and that the lengthy applications, which run to 60 pages on average, were processed entirely on paper. Applicants printed them out and submitted them in duplicate, with the original going to USCIS and a copy going to the State Department. Each application had to be checked against criminal, and customs and border protection records. The revenue from the premium program was supposed to cover the costs of providing the service and to supply funds for a much-needed effort to modernize USCIS’ infrastructure. 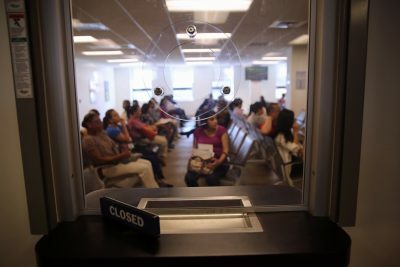 In 2005, USCIS launched the initiative, known internally as “Transformation,” whose main focus — and expense — has been mounting the Electronic Immigration System, or ELIS, an acronym that plays off the country’s longtime immigration gateway, Ellis Island. But ELIS mostly doesn’t work. Designed to process all 90 kinds of immigration petitions digitally, today it can manage just two. 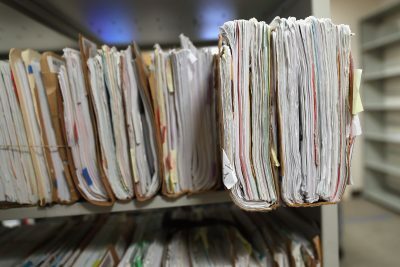 Visa applications are still submitted on paper, after which USCIS contractors place them in old-fashioned files and manually transcribe applicants’ biographical information into the same computer system used since at least 2003. The Department of Labor has digitally processed a form included in H-1B applications for almost 15 years, yet the same form has to be printed out and mailed to USCIS. To get an email from USCIS confirming receipt of an application, you have to send a paper “Request for e-notification” form. “To call it a transformation is insulting to intelligence,” said Houman Afshar, an immigration attorney who represents corporate clients. With much of its premium-processing windfall going into “Transformation,” since 2008 USCIS has chosen to use the proceeds from its regular visa processing program to try to cover the extra personnel and other costs related to the expedited service. Yates said the current logjam could have easily been avoided. “I would classify it as malfeasance if they took that money and then did not hire sufficient numbers of officers,” he said. Chad Graham, a lawyer who represents companies seeking H-1B visas on behalf of foreign workers, expects the suspension of premium processing to have an array of effects. Foreign workers renewing H-1Bs may not be able to travel internationally for months while their applications are pending, even if their jobs require it; in many states, they won’t be able to renew driver’s licenses either. Because of a rush to file as many H-1B renewals as possible before expedited service was suspended, USCIS said it hasn’t been able to keep up with its manual data entry. Recent detentions and seizures of phones and other material from travelers to the United States have sparked alarm. We detail what powers Customs and Border Protection officials have over you and your devices. With its funding source on pause, ELIS remains thirsty for resources. There’s been a steady drumbeat of reports from the Department of Homeland Security’s Office of the Inspector General saying the system’s flaws have resulted in worrisome mishaps. In a single month in 2013, USCIS sent out almost 2,500 green cards erroneously marked as valid for 10 years instead of two years because a faulty database had filled in incorrect information in the “expiration date” field. In 2014, the agency sent applicants over 5,000 green cards bearing the wrong names or birth dates. Some replaced the applicant’s first name with “No Given Name”; others included the wrong photos or fingerprints. USCIS made its citizenship application available on ELIS last April, then took it down four months later. The OIG later said it had found “alarming security concerns” with the process — including that ELIS was allowing applications to go forward that had not been properly checked against FBI and Customs and Border Protection databases. “We can see that they aren’t going to make that date either,” said Kristen Bernard, director of the information technology management division at OIG, who has overseen several audits of USCIS. Is there anything happening at U.S. Citizenship and Immigration Services that we should know about? Email [email protected] or contact him on Signal at 609-613-0526.